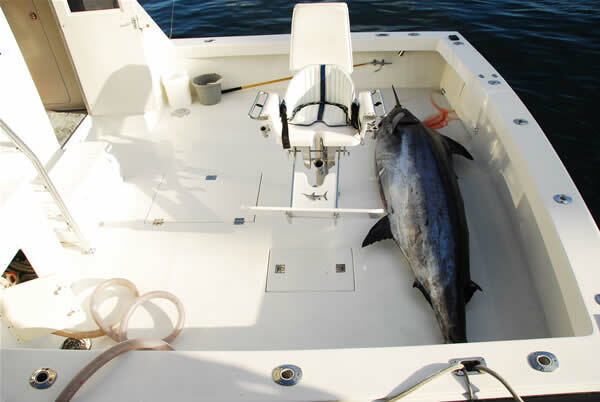 to Jamie C charters, your one stop source for all things fishing in Bermuda. The experienced crew of the Mega Bucks are looking forward to guiding you to an experience you will never forget. Reserve your trip early to avoid disappointment. No trip to Bermuda would be complete without a day of charter fishing. 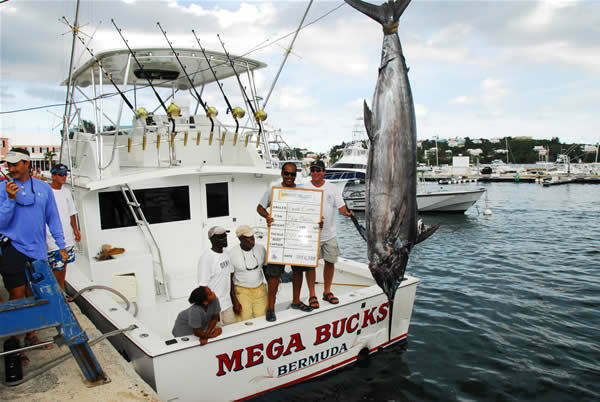 No one can provide a better fishing experience in Bermuda than Capt Sinclair Lambe aboard his brand new 43" Torres, the Mega Bucks. 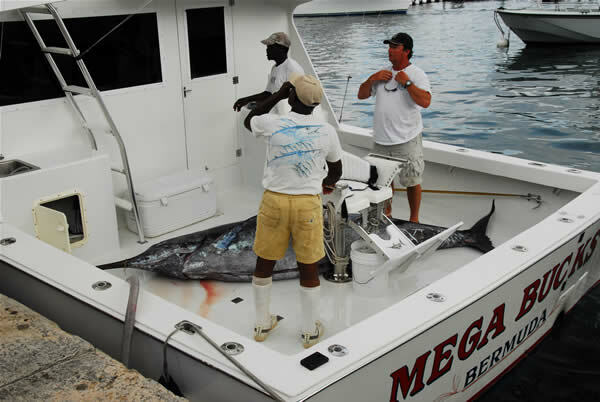 Capt Lambe has consistently guided both novice and experienced anglers to large fish off the coast of Bermuda. Bermuda fishing is quickly making a name for itself. Grander marlin are caught every year, plus the island supports a healthy, year-round population of other game fish such as wahoo, tuna, mahi mahi and large sharks. If you want to fish bermuda in style and comfort, with a Capt and crew dedicated to your experience, Jamie-C charters is for you. Call, fax or e-mail now to reserve a trip. This is a well known and popular experience among visitors and locals alike, so reserve early for the experience of a lifetime. "Captain Sinclair Lambe of Jamie C Charter Fishing (234-3081) has once again proven his sea worthiness with a win in this category for the second year in a row. A full day of deep-sea fishing with the entertaining captain on his beautiful, brand-new 43' Torres, Mega Bucks, is an experience not to be missed." July 9-13 2008: Tournament Award!!! - Largest Fish!!! 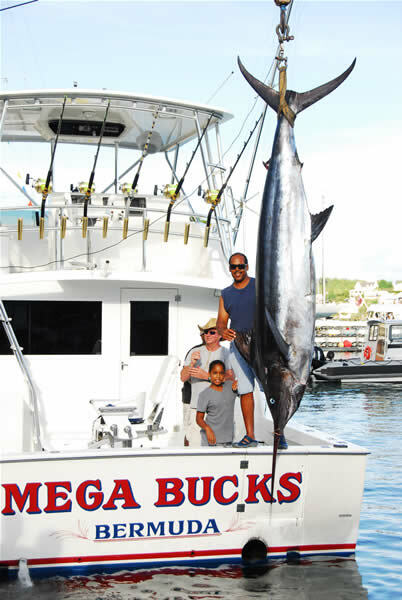 Bermuda Big Game Classic biggest fish overall - 832 lb marlin for more information see Marlin Magazine October 2008 issue. 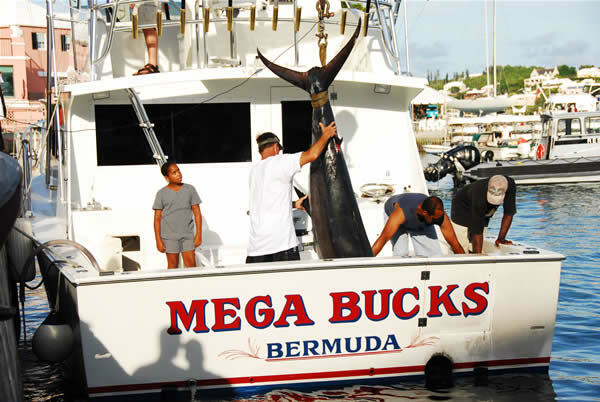 July 4 2008: World Cup Marlin Tournament, 46 boats competed from Bermuda. 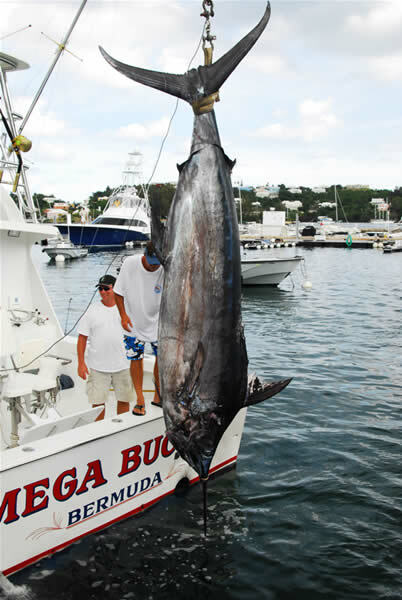 Megabucks caught 3rd biggest blue marlin worldwide 651 lbs.